Google Expeditions and The White House have teamed up to bring a holiday-themed tour of the president's home to virtual reality. 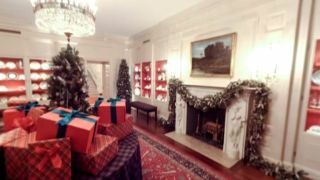 The VR tour was posted on The White House's YouTube page, showcasing the residence decked out in full Christmas splendor. Google Expeditions, a "virtual field trip" program, combines Google's Cardboard VR headset with the GoPro Jump rig, a 16-camera setup to capture immersive 360-degree video footage. Viewers can step right into the shoes of a visitor taking a tour of the White House, showcasing highlights such as the library, china room and even a cameo by one of the Obama family's pets, Bo. While the experience works best using Cardboard or the Samsung Gear VR, those without a virtual reality rig can also partake in the holiday festivities by scrolling around on a desktop as well as on a smartphone, which even moves in response to the viewer's position. The White House isn't the only location to get the treatment from Jump's VR-ready video, with an entire playlist sending viewers to exotic locations ranging from the Congo to the Grand Canyon, and every places in between, like an Avicii concert.